Widgee Shire, abolished in 1993 following a merger with Gympie City, extended south-westerly from the Cooloola Coast, touching the boundaries of the Noosa and Maroochy Shires. It surrounded the separate Gympie municipality entirely. The name is thought to have derived from an Aboriginal word meaning red cedar, which was extensively harvested from the upper reaches of the Mary River valley, through Kenilworth, Imbil, Kandunga and Amamoor. The Shire began as the Widgee local government division in 1879, including the subsequent shire of Kilkivan (severed 1888) and part of Noosa Shire (severed 1909). It excluded Gympie and its adjoining Glastonbury goldfield division, although Glastonbury was subsequently added to Widgee. The Shire comprised much impenetrable scrub and had rich timber reserves in the Mary River area, and by the 1850s coastal timber cutting was underway and pastoral runs taken up. Several pastoral runs were consolidated into the Widgee Station, the district's largest and most successful. 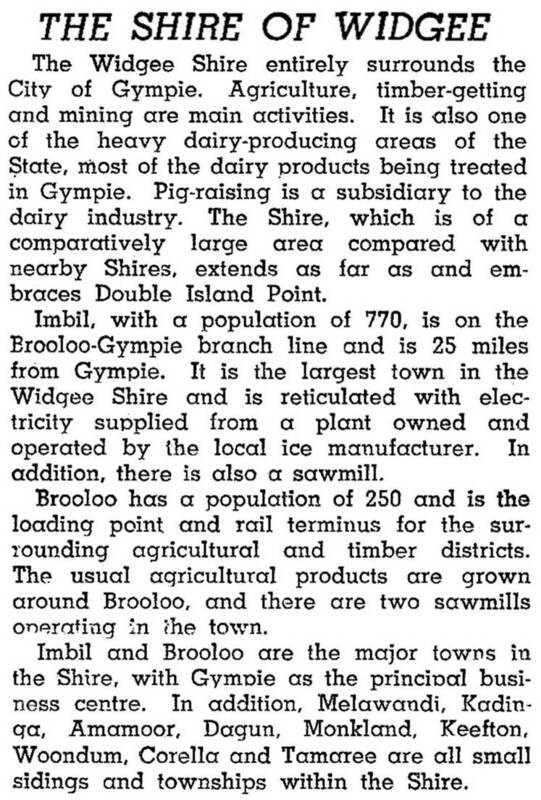 During the 1960s-70s the shire's population fell as timber reserves declined and the industry was mechanised. Dairying, beef cattle, fruit and vegetable growing were maintained in the Mary Valley, and deer grazing for venison was later introduced. It was away to the east that population grew, in land formerly thought to be second class: sand-mining on the Cooloola Coast led to the establishment of Rainbow Beach and prawn fishing in Tin Can inlet provoked a population surge in Tin Can Bay township. Cooloola Village, also on the Tin Can inlet, was later developed. Widgee Shire's administrative centre was always in Gympie, and in 1993 the two local government areas amalgamated to form Cooloola Shire.